Welcome to E Platt & Sons, Bolton’s oldest scrap metal merchant. We buy scrap metal from the public and trade alike, offering a Drive-Thru drop off at our Waterloo St depot and a collection service for larger quantities. We buy all types of metals such as lead, brass, aluminum, stainless and copper. eg, copper tube, copper cylinders, braziery copper, bright copper wire etc. In addition to non ferrous metal, we also buy ferrous metals ( steel & iron ) at competitive prices. We are committed to obtaining and passing nothing but the very best prices to each and every one of our customers, this is why we do not charge for skip hire or collection, meaning you get 100% of the scrap value, whatever scrap metal you have. To comply with current laws, we can pay you for your scrap metal directly into your bank account or by issuing you with a pre-paid Visa card. More details on our payment systems can be found on our Cashless Payments page. 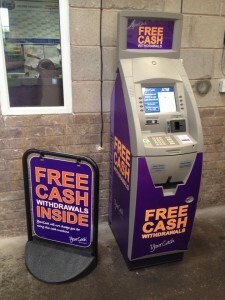 We have just had a brand new, state of the art cash machine installed at our Bolton depot to compliment our E Platt & Sons Visa cards, which means you will receive your invoice, your money will be instantly transferred onto your card, then you can instantly withdraw the cash from the on site cash machine which does not charge! So you now will be able to walk out with cash in your pocket, just like the old days.